So, you’re still skipping breakfast? We get it. It’s hard to pull off the most important meal of the day when you’re just trying to get out the door. The thing is, you don’t have to fire up a skillet to start your day with eggs. There are tons of breakfast meal prep recipes that will keep you going all week long. With just a little time in the kitchen, you can start every day with the goodness of eggs. With protein, vitamins B12, A, D, E, folate, iron, zinc and more nutritional benefits, there really is no better breakfast. These are SO GOOD, and they’re gluten free (if you’re into that kind of thing). The secret to their rich flavour is cooking down the veggies in a few spoonfuls of bacon fat. 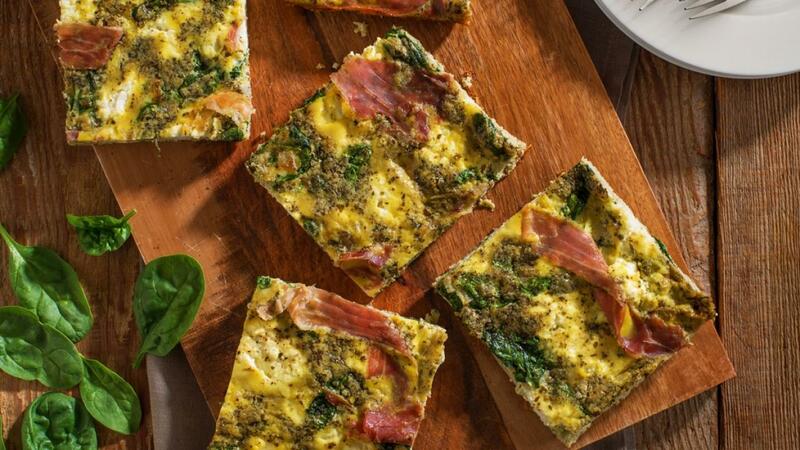 Bake, slice, and saran wrap these squares in the fridge for a grab and go breakfast you can eat anywhere. Looking for a sweeter square? Try these breakfast bars with oats, nuts and dried fruit that pack the protein of eggs, too! Courtesy of Chef Lynn Crawford, this frittata recipe helps you hang onto those lazy Sunday vibes all week. Whether you make your own pesto with this blender recipe, or pop open a jar from the store, we love how the creamy ricotta and salty ham complement pesto’s herby, earthy flavours. Cut into squares or bake into individual muffin tins for a one-handed breakfast that feels like a weekend morning. Have a sweet tooth in the morning? You’re not alone! These power muffins are one of our most popular sweet recipes, and lucky for you, they’re packed with way more good stuff than your typical coffee shop muffin. Made with bran, flax seeds, whole-wheat flour and pumpkin puree, these muffins fuel you up and keep you full. Want more muffin options? Try these Lemon and Blueberry Cottage Cheese Muffins or Savoury Muffins with Tomato and Feta. This healthy egg recipe comes to us from a B.C. egg farming family, so you know it’s both tasty and super nutritious. We love diced tomatoes, fresh spinach, chopped green onion and a little parm in ours, but recipe author and egg farmer, Joleen Bisschop, recommends trying a little smoked salmon for a B.C. twist. Want more muffin tin recipes? There you have it, 15 breakfast ideas that you can make once and eat all week. Whether you love sweets or keep it savoury, you officially no longer have an excuse to skip breakfast. Show us your early-morning eats on Instagram!